I struggled a bit for a title here. 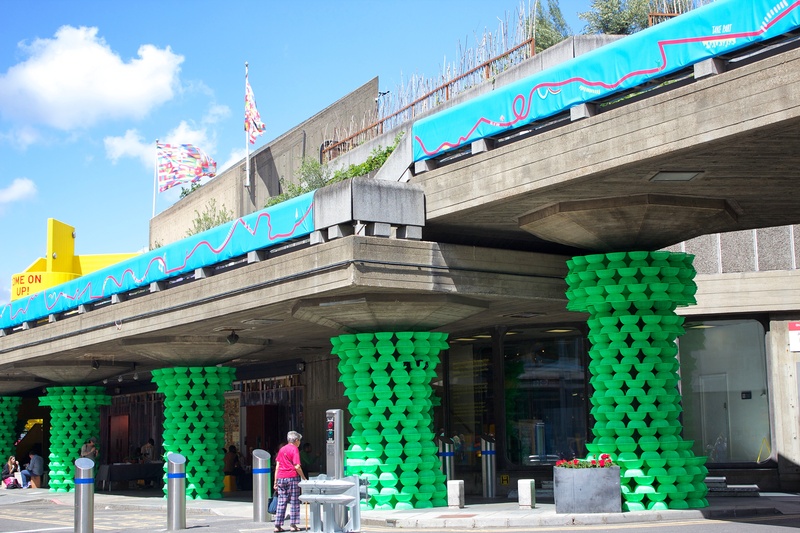 The pillars are surrounded in what appears to be bright green colanders, and it looks like a child has scribbled over the wall in crayon. Still, at least I got to use colander as a tag. Hyperbole is a tricky beast. I think I always end up sounding sarcastic. Thanks! never seen pillars like this before, thanks for sharing! I went and photographed these on Sunday after seeing your photo!!! Aha, someone else as interested in colanders as myself! That area is such a great place for photos – every time I go there is something new. yes, its one of the reasons I love wandering around down there. I used to work just off Millbank and would often wander down the south bank at lunchtime just to find something new to look at! Do you remember the elephants? I don’t, and looking on the webs I think it happened when I was away from London. Shame, as I like them more than the cows that seem to be scattered everywhere! Oh, I went and photographed each one of the 260 elephants.. Did it all for charity tho, so made it worth it. I never want to see an elephant again!! 260? That’s quite a feat, and quite an exhibition! Did they make it online anywhere?